Thanks to current right-wing populists, people are conflating right wing ideologies such as being anti-migrant with populism. No doubt thanks to Donald Trump, Brexit, and a string of anti-establishment leaders and parties in Europe, Latin America and Asia, everyone seems to be talking about populism. But populism is nothing new. It’s long accompanied democratic politics, and its activity and success has experienced peaks and troughs. Right now we’re in a bit of a heyday for populism, and this is impacting the nature of politics in general. So it’s important we know what it means and how to recognise it. Even among academics, populism has been difficult to define. This is partly because it has manifested in different ways during different times. While currently its most well-known cases are right-wing parties, leaders and movements, it can also be left-wing. these ordinary people must stand in opposition to an elite establishment which stops them from fulfilling their political preferences. These two core principles are combined in different ways with different populist parties, leaders and movements. For example, left-wing populists’ conceptions of “the people” and “the elite” generally coalesce around socioeconomic grievances, whereas right-wing populists’ conceptions of those groups generally tend to focus on socio-cultural issues such as immigration. The ambiguity of the terms “the people” and “the elite” mean the core principles of people-centrism and anti-elitism can be used for very different ends. How can appealing to ordinary people be a bad thing? Populism gets a bad name for a couple of reasons. First, because many of the most prominent cases of populism have recently appeared on the radical right, it has often been conflated with authoritarianism and anti-immigration ideas. But these features are more to do with the ideology of the radical right than they are to do with populism itself. Second, populists are disruptive. They position themselves as outsiders who are radically different and separate from the existing order. So they frequently advocate for a change to the status quo and may champion the need for urgent structural change, whether that is economic or cultural. They often do this by promoting a sense of crisis (whether true or not), and presenting themselves as having the solution to the crisis. A current example of this process is Trump’s southern border wall, where he’s characterised the issue of illegal crossings on the southern border as a national emergency, despite, for example, more terrorist-related border crossings occurring on the northern, Canadian border and by air. The fact populists often want to transform the status quo, ostensibly in the name of the people, means they can appear threatening to the democratic norms and societal customs many people value. And the very construction of “the people” plays a large part in populists being perceived as “bad”, because it ostracises portions of society that don’t fit in with this group. What are some examples of populist leaders and policies? The most famous contemporary example of a populist leader is the president of the United States, Donald Trump, and the renewed interest in populism is partly due to his 2016 electoral success. One way researchers measure populism, and consequently determine whether a leader or party is populist, is through measuring language. Research has found Trump’s rhetoric during the campaign was highly populist. He targeted political elites, drawing on the core populist feature of anti-elitism and frequently used people-centric language, with a strong use of collective pronouns of “our” and “we”. He combined this populist language with his radical right ideology, putting forward policies such as “America First” foreign policy, his proposed wall between the US and Mexico, and protectionist and anti-globalisation economic policies. The combination of populism and such policies allowed him to draw a distinction between “the people” and those outside that group (Muslims, Mexicans), emphasising the superiority of the former. These policies also allow for the critiquing of the elite establishment’s preference for globalisation, free trade and more liberal immigration policies. His use of the “drain the swamp” slogan – where he’s claiming he’ll rid Washington of elites who are out of touch with regular Americans – also reflects this. Along with Trump, Brexit has also come to exemplify contemporary populism, because of its European Union-centred anti-elitism and the very nature of the referendum acting as an expression of “the people’s” will. In South America, populism has been most associated with the left. The late Hugo Chavez, former president of Venezuela, was also highly populist in his rhetoric, and is perhaps the most famous example of a left-wing populist leader. Chavez’s populism was centred around socioeconomic issues. Even while governing, he positioned himself as an anti-establishment politician, channelling the country’s oil revenues into social programs with the aim of distributing wealth among the Venezuelan people, relieving poverty and promoting food security. The current Mexican president, Andrés Manuel López Obrador, and the Bolivian president, Evo Morales are also considered left-wing populist leaders. But left-wing populism is not just confined to South America. In Europe, contemporary examples of left-wing populist parties include the Spanish Podemos and the Greek Syriza. These parties enjoyed success in the aftermath of the Great Recession. They questioned the legitimacy of unregulated capitalism and advocated structural economic changes to alleviate the consequences of the recession on their people. It doesn’t look like populism is going anywhere. So it’s important to know how to recognise it, and to understand how its presence can shape our democracies, for better or worse. The funding proposal is no fix for Australia’s health system but it could take some political pressure off the Coalition in the lead up to the 2019 federal election. The A$1.25 billion Community Health and Hospitals Program Prime Minister Scott Morrison announced this week should be awarded a big policy fail. The move sets back Commonwealth-state relations by decades – and it’s unclear exactly how much money will actually be provided. Rather than being based on any coherent policy direction, it appears designed to shore up support in marginal electorates. One of the complicating factors in providing health care to Australians is the fact that the Commonwealth and states each have leadership roles in different parts of the system: the Commonwealth for primary care; and the states for public hospitals. Health professionals yearn for the Holy Grail of a single level of government being responsible for all aspects of a patient’s care. That quest has proved illusory. But recent policy direction has at least sought to clarify the roles of the two levels of government. For the past five years, the states have been acknowledged as the “system managers” of the public hospital system. A rational, formula-driven funding framework has been created. Under this framework, the Commonwealth shares the cost of growth in public hospital activity with the states. This exposes the Commonwealth directly to growing costs of technology-driven needs and giving it an incentive to work with the states to meet needs in the most efficient way. This framework means there is one level of government to whom all public hospitals are accountable: the state. And it means voters can hold their state government accountable for hospital planning and management. The new Morrison proposal tramples all over this policy rationality in the interests of electoral expediency. It replaces state-based planning with submission-based funding, which will enable a politician with a whiteboard in Canberra to override state priorities in favour of projects which have the greatest electoral appeal in targeted marginal seats. It makes accountability for the overall system more confusing, and it assumes Canberra knows best. It is a federalism fail. Labor ran a devastating campaign in the July federal by-elections, especially in the Queensland seat of Longman, which involved calculating and publicising precisely how much worse off the local hospital was under the Liberal health policy – where the Commonwealth funds 45% of hospital growth – compared with Labor’s 50% sharing policy. In the Longman case, Labor asserted there was a A$2.9 million cut to Caboolture Hospital based on the decisions taken in the 2014 Abbott/Hockey “slash and burn” budget. Scott Morrison’s new cash splash is no doubt designed to overcome this political weakness for the Coalition. However, unlike Labor’s funding, which is ongoing, it’s unclear whether the extra largess the Coalition is offering will continue beyond the budget “forward estimates” (that is, the next four years). It’s unclear how much will be devoured from existing Commonwealth funding agreements, such as the dental agreement, which are coming to an end. The Commonwealth has responsibility for most aspects of policy to address social determinants of health, particularly employment and income policies. Rational health policy would recognise the importance of considering these issues and balancing the health benefits of, for example, lifting the Newstart allowance, against funding for specific health initiatives. There is no hint this has happened with this announcement. New handouts under the Morrison package will be portrayed as being for specific areas of “high political need”. But the reality is funding will eventually be swept into the Grants Commission allocation process and redirected according to the Grants Commission formula. This may restore some rationality into the health handout, albeit with a lag of a few years. But the actual level of funding to be allocated to specific areas will be shrouded in Grants Commission opacity. Insiders will be able to follow the money, but voters will be kept in dismal ignorance about how much they will benefit in the long-term – after the gloss of a local funding handout has worn off. This policy is a transparency fail. Everyone has a potential place in this funding Nirvana. Lobby your local MP, and your local hospital or community health program might be the lucky health policy lottery winner! Provided voters don’t see this as a cynical political exercise – and that is a big risk in an electorate which already ranks politicians low on the trustworthiness scale – then the new policy could be smart politics. We won’t know until the votes in next year’s federal election are counted. In the meantime, given the drubbing the Liberals received in last month’s Victorian state election, the biggest challenge for the Morrison Government might be deciding which electorates are now marginal and worth shoring up. Unification flags hang on a military fence near the demilitarised zone separating the two Koreas in Paju, South Korea. The prospect of South Korean and North Korean athletes marching together under a “unification” flag at this month’s Pyeongchang Winter Olympics signifies a brief respite in tensions rather than being a genuine thawing on the Korean peninsula. After an initial surge of optimism in response to Pyongyang’s decision to accept Seoul’s offer to march as one Korea, reality has started to bite with the mechanics of implementing the deal. While welcoming the Pyeongchang initiative, many South Koreans have pushed back against the decision to merge both countries’ women’s ice hockey teams, calling out the sexist nature of the decision (not a single woman was involved in determining the merger). Meanwhile, citing “insulting” behaviour on the part of South Korean media, the North Koreans have cancelled a joint cultural performance with South Korea, scheduled for next week. Understandably, the Pyeongchang “thaw” has attracted major headlines. But it obscures the significant possibility that we will witness major conflict on the Korean peninsula in 2018. The South Korean government has worked hard to engage North Korea in structured dialogue in an effort to defuse the nuclear-armed state’s continued military threats. But there is nonetheless a growing risk that the Trump administration will authorise limited military strikes against the North’s weapons of mass destruction, conceivably within the next few months. Despite extracting a commitment from the US that any military action against North Korea is contingent on first gaining South Korea’s endorsement, there is justifiable concern among South Koreans that the Trump administration will act unilaterally if US intelligence assesses Pyongyang is about to deploy an operational nuclear-armed intercontinental ballistic missile (ICBM) force. Given the extent to which we have underestimated the sheer pace of North Korea’s nuclear and missile development over the past decade, this intelligence assessment might happen sooner than we think. Donald Trump would then face a difficult problem: how to avoid being the president who allowed North Korea to achieve the capability to hit the US homeland with nuclear weapons. Since coming to power, the Trump administration has been deliberating over whether to carry out preventive strikes to degrade Pyongyang’s ability to sprint to the finish line of acquiring a deployable ICBM that can hit the continental US with a nuclear payload. An increasingly popular assumption is that the price of living with a nuclear-armed North Korea that can destroy prime targets on the US mainland is higher than risking a second Korean War. And this is not just the musings of a few hardheads in the Pentagon: a growing number of Americans believe some form of military action against North Korea is justified if sanctions and diplomacy fail to achieve denuclearisation. Most worrying of all, a belief seems to be gathering pace that the US can somehow launch “surgical” military strikes while containing a larger conflict, because Kim Jong-un will not respond for fear of triggering an overwhelming retaliatory response. There are two basic flaws underlying what one expert has termed “the myth of the limited strike”. The first, and most obvious, is that it’s highly unlikely Kim Jong-un will believe the Trump administration’s assurances that “surgical” strikes are not the opening phase of an all-out US assault aimed at overthrowing the regime. When the US goes to war, it tends to go full throttle – in recent times, this has translated into regime change (think of Afghanistan, Iraq, and Libya). Why would the leadership in Pyongyang assess that this time around would be any different? The second major flaw in the argument is that what is portrayed as limited in Washington, and among some armchair strategists supporting this course, will inevitably be seen in Pyongyang as a major assault on North Korean territory and its prized strategic assets. Even in the scenario that Kim Jong-un actually believed the Trump administration did not intend to implement regime change, as Van Jackson notes, his position as North Korean supreme leader would be untenable domestically if he did not respond with force. Pyongyang would have a compelling incentive to retaliate early with any nuclear reserve that survived a US first strike. In this scenario, the North Korean leadership would confront a stark choice of either using these weapons of mass destruction to maximum effect or risk losing them in follow-on US precision munition strikes. As I have argued elsewhere, like all new nuclear powers, North Korea will place a premium on permissive command and control systems that allow authorities to use nuclear weapons whenever they want. This will be reflected in a hair-trigger launch posture if it perceives an imminent threat. Whichever way you cut it, a US first strike against North Korea would almost certainly trigger major war on the Korean peninsula, with a high risk of escalation to full-scale nuclear conflict. While the appalling humanitarian consequences of this don’t need to be spelt out, the strategic illogic of the arguments advocating a first strike must be continually reinforced. Australia’s federal government has announced a royal commission into the financial services sector, following a letter from the big four bank heads supporting the move. The commission will run for 12 months, delivering a final report in February 2019, at an estimated cost of A$75 million. It will explore not only banking but also the wealth management, superannuation and insurance industries. Prime Minister Malcolm Turnbull had previously denied the need for a royal commission but said in announcing the move that political uncertainty had forced the decision. “Uncertainty…over the potential for such an inquiry is starting to undermine confidence in our financial system. And as a result, the national economy. And that is precisely what we have always been determined to avoid,” he said. The commission should be allowed to go on for longer, for closer to three years, because the 12-month period is the bare minimum, says Andrew Schmulow, a senior lecturer in the faculty of law at University of Western Australia. “If the commission doesn’t find other skeletons in the closet, I will eat my hat,” he adds. Schmulow believes there will be more revelations to come from the commission and that the banks will have to answer for covering up these as well. “You can’t have this many scandals on this kind of scale without a corporate culture that is rotten to the core,” he said. The royal commission won’t award compensation but will have the powers to compel the banks and other institutions to present documents and witnesses. Earlier in the year, in an attempt to fend off a royal commission, the government announced a raft of new measures in the 2017 Federal Budget to address concerns surrounding the finance industry. Malcolm Turnbull defended the delay in calling the royal commission due to these measures. “There would’ve been legitimate calls to delay any new measures until the findings of the inquiry were handed down. And that is one of the reasons why we have not established a banking inquiry to date,” he said. Opposition leader Bill Shorten said the timing of the commission called into question the government’s credibility and said that Australians had every right to be cynical. Turnbull’s move comes after the possibility of a Nationals bill on the same issue. Andrew Schmulow, said it was “stage managed”, designed to regain control on the terms of reference and the length of the commission. “Turnbull either losses control or keeps a modicum of control. It’s one or the other,” Schmulow said. The bank heads, in their letter to the government, described the deliberations on the commission as “costly and distracting”. But the real cost is to the economy and is a direct result of the bank behaviour, Schmulow said. The funding costs of the banks are based on a risk profile which is underwritten by taxpayers through an implicit bank guarantee, which will only be affected if the government itself suffers a credit downgrade, Schmulow said. Mum and dad investors are often brought up as having a vested interest in the banks’ strength through their superannuation. But Schmulow says a small portion of super is invested in the banks but it’s also invested in other things in the economy as well. He says investors’ savings are more likely to be hurt by the impact of the behaviour of the banks in other areas of the economy. “They are already making so much profit off every individual and company that borrows money we have the most profitable banking sector in the world, you only get that by gouging,” Schmulow says. Banks have traditionally prioritised shareholders and investors have had a superb return on equity said Elizabeth Sheedy, associate professor of financial risk management at Macquarie University. But she said the community seemed to be wanting the balance to shift more in favour of the customer rather than returns and this raised fundamental questions about bank governance. “Should remuneration be based on the metrics of concern to shareholders (profits, return on equity) or metrics of concern to customers (lack of complaints, value for money)? These fundamental questions are not going to be resolved in the ordinary course of business and a far-reaching inquiry seems to be a way that they can be thoroughly aired and debated,” Sheedy said. “It seems that the community is prepared to pay that price in order to create a better deal for customers,” she added. The commission won’t examine regulators like the Australian Securities and Investments Commission (ASIC) or the Australian Prudential Regulation Authority (APRA) who have recently been given more power to hold the banks to account. The regulators have been criticised in the past for their inaction on scandals in the banking and financial sectors. But Andy Schmulow said the royal commission would show up their inaction and raise serious questions about who was watching the watchdogs. Eliza Wu, associate professor in finance at the University of Sydney says the banking sector’s exposure to the real estate market and the lack of regulatory oversight of the fintech and peer-to-peer lending sectors, were a worry. “The heavily disrupted world of banking and finance is evolving very quickly and the regulators and often industry operators themselves, exist under an unforgiving regime of catch-up,” she said. 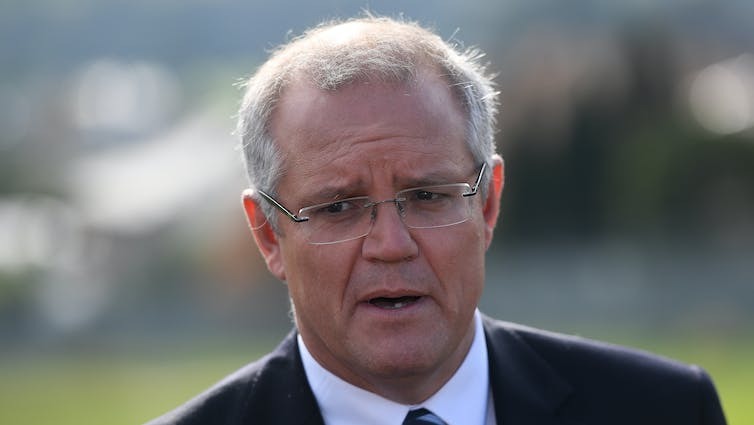 In distinguishing between “good” and “bad” debt, federal Treasurer Scott Morrison equates good debt with infrastructure investment. However, not all infrastructure investment announced in the budget is necessarily “good”. We are now in the Anthropocene – a new geological age defined by the global scale of humanity’s impact on the Earth – which places new requirements on our infrastructures. We need to move beyond the AAA ratings mindset, and instead aim for net-positive outcomes in social, economic and ecological terms from the outset. Infrastructure (such as transport, water, energy, communications) underpins our ability to live in cities and our quality of life. And most infrastructure is very, very long-lived. Therefore, our infrastructure investment decisions matter enormously, especially for tomorrow. More than half of the world’s people live in cities, and have just one planet’s worth of material resources to share around. This means we must define a new set of expectations and performance criteria for infrastructure. Rather than settling for doing less bad, such as less environmental destruction or social disruption, we must aim from the outset to do more good. This net-positive approach requires us to restore, regenerate and increase social, cultural, natural and economic capital. What sort of change is needed? Examples of this kind of thinking are, as yet, rare or small. Bishan Park on the Kallang River in Singapore gets close. Formerly a channelled stormwater drain, this collaboration between the national parks and public utility agencies has recreated significant habitat while providing flood protection and an exceptional recreational space. All this has been done in an extremely dense city. Singapore’s Bishan Park is an example of a new approach to urban infrastructure. Looking further into the future, in transport, a net-positive motorway might prioritise active transport and make public transport central by design. It might send price signals based on the number of passengers, vehicle type (such as autonomous) and vehicle ownership (shared, for instance). Net-positive thinking aligns with a groundbreaking speech by Geoff Summerhayes, executive board member of Australia’s Prudential Regulation Authority (APRA), earlier this year. He identified climate change risk as a core fiduciary concern, and therefore central to directors’ duties. This shift raises significant questions for the financial and operational validity of major infrastructure projects. For example, in assessing the WestConnex motorway project, Infrastructure Australia queried why a broader set of (potentially less energy-intensive) transport options was not considered. Similar questions arise for the Northern Australia Infrastructure Fund’s support for Adani’s giant Carmichael coal mine and associated water and transport infrastructure. A core part of the switch to net-positive infrastructure is the realisation that resilience and robustness are different things. Historically, robustness has been central to infrastructure planning. However, robustness relies on assuming that the future is more or less predictable. In the Anthropocene, that assumption no longer holds. How do we build in resilience? So, the best we can do is set ourselves up for a resilient future. This is one where our infrastructure is at its core flexible and adaptable. This could include, for example, phasing infrastructure investment and development over time. Current analysis is biased toward building big projects because we assume our projected demand is correct. Therefore, we expect to reduce the overall cost by building the big project now. However, in a more uncertain future, investing incrementally reduces risk and builds resilience, while spreading the cost and impact over time. This approach allows us to monitor and amend our planning as appropriate. It has been shown to save water utilities in Melbourne as much as A$2 billion. Maybe the fact that we can be criticised for not having enough capacity ready in time has influenced our decision-making. We should really be challenged over investing too much, too soon, thereby eliminating the opportunity to adapt our thinking. Or maybe we are so concerned about the need to build certainty into our planning that we are missing the opportunity to build learning through feedback loops into our strategies. Surely there is a balance to be struck between providing enough certainty for investment without pretending we know with absolute certainty what we need to invest for the next 30 years. much existing infrastructure approaching or past its end of life. Regulatory reform is part of what’s required to enable public and private investment in better outcomes. Here too we need to learn our way forward. Sydney’s emerging, world-leading market in recycled water is an example of a successful niche development that delivers more liveable and productive pockets in our cities through innovative integrated infrastructure. Ultimately, doing infrastructure differently will also require investment in research on infrastructure. The UK is investing £280 million in this through the Collaboratium for Research on Infrastructure and Cities. But in Australia’s recent draft roadmap for major research investment, infrastructure is largely absent. We overlook infrastructure research at our peril. Can You Erase Bad Memories? Just as Cyprus was disappearing from the news, the link below is to an article reporting on just how bad the situation in Cyprus really is. The link below is to an article reporting on the latest conflict news, including reports that the United Kingdom could arm the rebels if things get any worse – I’d hate to think how bad that could be given what has happened there over the last couple of years.